MOSCOW, November 12. /TASS/. Manned spacecraft Soyuz MS-11, due to be launched from Baikonur on December 3 with another expedition to the International Space Station, has passed vacuum tests, the space rocket corporation Energia (the spacecraft’s designer) has said on its website. The spacecraft’s systems and compartments have passed vacuum tests. 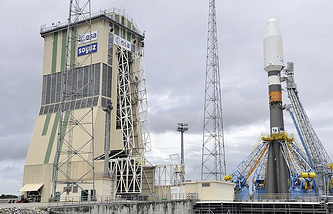 After that the Soyuz MS-11 was moved to a stand where it is to be connected to ground testing systems, Energia said. Soyuz MS-11 is to take to the ISS Roscosmos’s Oleg Kononeko, NASA’s Anne McClain, and Canadian Space Agency’s David Saint-Jacques. It will be the first manned space launch to the ISS after the October 11 aborted launch of the Soyuz-FG rocket carrying the manned spacecraft Soyuz MS-10 with a crew of two - Roscosmos’s Alexei Ovchinin and NASA’s Nick Hague. The crew was not hurt. It was the first manned space launch emergency in 35 years. An inquiry found the accident was due to a malfunctioning stage separation sensor, damaged when the launch vehicle was assembled at the Baikonur space site. The ISS’s current crew are Roscosmos’s Sergei Prokopiev, NASA’s Serena Aunon-Chancellor and the European Space Agency’s Alexander Gerst.